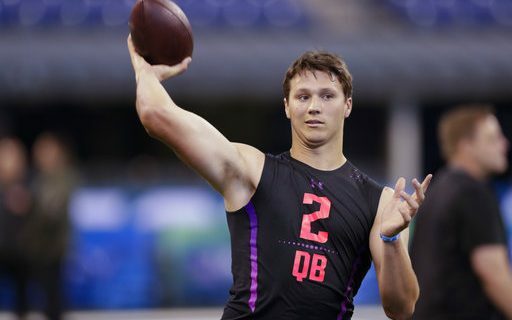 Gabriel: Does Josh Allen Compare to Matt Ryan? The other day I was having a text conversation with a New York Jets beat writer for one of New York’s daily papers. The conversation was about the quarterbacks, because as we all know, the Jets will be taking a quarterback with the third pick in the NFL Draft in three weeks. During the course of the conversation Wyoming quarterback Josh Allen came up and this writer was trying to tell me that Allen compared to the Atlanta Falcons Matt Ryan as a college quarterback. The reason for his comparison is that Ryan had less than a 60% completion percentage his final year at Boston College. Having scouted Ryan thoroughly when he was at BC, I could easily make the comparison. Let’s talk about Ryan first. Ryan was a three year starter at BC from 2005 through the 2007 seasons. In those seasons, BC finished 9-3, 10-3 and 11-3 respectively in the ACC and that included Bowl wins in each of the three seasons. Boston College played a pro-style offense in those days with some spread formations in passing situations. In these years he was very productive. In 2005 he competed 121 of 195 throws for 62.1%, 8 touchdowns and 5 interceptions. In 2006 he was 263 of 427 throws for 61.6 %, 15 touchdowns and 10 interceptions. In his final season he completed 386 of 654 throws for over 4000 yards, 31 touchdowns and 19 interceptions. In the offense BC was playing there weren’t many high percentage bubble screen throws as most of his passes were downfield (I was at three games in 2007). Ryan did play some as a freshman and completed only 49% of his 71 passes. For his career, he completed 59.9% of his passes but in his three years as a starter, his completion percentage was 60.5% and in the offense Boston College was playing, those were very good numbers. Now looking at Josh Allen, he only played two seasons at the Division I level as he was a junior college transfer. The offense that Wyoming plays is a college spread with a lot of half field reads and a high number of bubble screens. Wyoming also plays in the Mountain West Conference which is a step or two below the ACC as far as level of comparison and also is a very weak defensive conference. IN 2016, Allen was 209 of 373 throws for 56%, 28 touchdowns and 15 interceptions. This past season he missed two games because of a shoulder injury but in the 11 games played he completed 152 of 270 throws for 56.3%, 15 touchdowns and 6 interceptions. Allen’s won/lost record the last two seasons was 8-6 in 2016 and 8-3 in 2017. What’s even more important is that when Wyoming stepped up in competition and played Power 5 schools, Allen’s numbers dropped off. Against Nebraska in 2016 he was 16 of 32 for 189 yards, 1 touchdown and 5 interceptions. This past season versus Iowa he completed 23 of 40 for 173 yards, no touchdowns and 2 interceptions. Allen is a little bigger than Ryan (6’5 – 235 to 6’4 220) and a better athlete. He also has a much better arm. While arm strength is good and helps in cold weather cities, accuracy is always the key stat. Over the last 10-12 years there has been no quarterback with a college completion percentage lower than 58% who came into the NFL and had success. If Allen is successful at the NFL level, he will be the first. I have banged on Allen enough over the last six months so there is no need to go further, but to try an compare Allen to Matt Ryan as college quarterbacks is absurd. The comparison isn’t close! Read Greg Gabriel’s scouting report on Josh Allen.